I had been trying to hunt down a boxwood wreath to hang in the window but had no such luck. I was even going to break down and order the set of four small ones from Ballard but they were sold out. I figured between Michael's and HobLob I could at least find a boxwood candle ring that could pose as a wreath. No such luck so I had to make a wreath instead. All I did was hot glue some greenery from a garland to a small grapevine wreath. I would have used florist wire but I ran out and I wanted the project done like last week. Though it is not boxwood I think it turned out pretty darn nice! I had enough to make two so now I am trying to decide where to hang the other one. And before I go I had to share a pic of my assistant for the day. It usually is her brother that is supervising and she is rather elusive but today she decided she wanted to be a part of the wreath making. Her favorite room in the house is the guest bedroom! Ok my friend I'm stealing this idea from you as I have everything here to make one ha ha!! Gorgeous bathroom Pam! I love the addition of the wreath too! You are one talented chica. The wreath is a beauty and looks great hanging in the window. 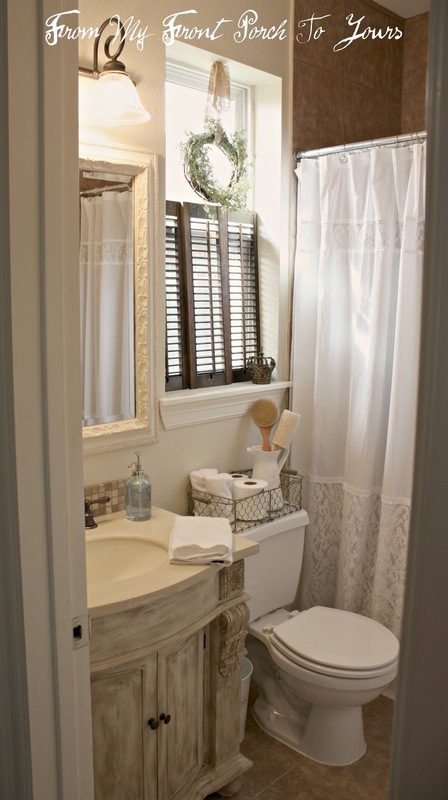 Love your bathroom and the wreath is perfect there. Your wreath looks amazing. I've been on the lookout for boxwood too with no luck. What did you finally end up using? Your bathroom looks wonderful. You're so creative,Great job on the wreath. Pamela I can see why this is your favorite space, I love this bathroom! The wreath was the perfect finishing touch. The window looks so pretty! The wreath is so sweet....slight imperfections make it all the more endearing! Great job on the bathroom! What a pretty wreath and the perfect spot for that one. I love the light shining through it. I added a berry wreath I had to our front entry closet door. Just tied it up in a similar way to yours with burlap ribbon and I love it there. Our entry is small and it is one of the few accessories in this space. The wreath is a perfect touch...I love how it looks! I'm your newest follower from the savvy southern party. If you get a chance, I'd love you to stop by my blog & follow along too! I'm also hosting my first giveaway...come by and enter to win a free My Memories digital scrapbooking program. What a beautiful bathroom! 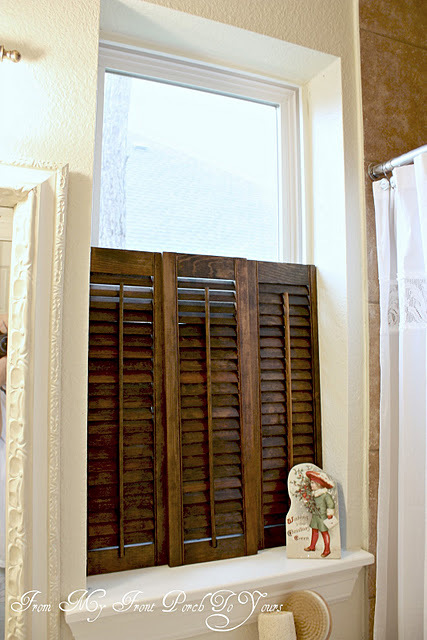 I love your decor, wish I had plantation shutters! Pamela, your bathroom is gorgeous! The wreath is the crowning touch, and I love that burlap ribbon. My sister-in-law wanted a small boxwood wreath, but I told her to make one like you did. Beautiful! I love your wreath that you made! It looks lovely hanging in the window. I could go into that bathroom and never come out :) So beautiful. It's one of my favorite makeovers too, it looks great! Couldn't "pin it" fast enough! Love these images, especially your assistant! What a great idea. It actually has more of an airy look than perhaps a boxwood wreath. Love it! Your bathroom is adorable as well. Your bathroom is adorable! The wreath just adds a special touch to the window! I am one of your new followers, hope you will visit my blog and follow me! Guess you did good when it's even the cat's favorite room!